Galae Restaurant in Chiangmai, Thailand has always been a favourite with me. Situation on the slope of Doi Suthep, next to a lake, this place has excellent views and ambiance. What’s more, I bought a condo near this place in 1997 and it was a convenient place for me to dine while I was in Chiangmai. In June 2015, I sold the place and decided to make a trip to Galae to check the place out. The food was still good, but they have obviously cut corners. Gaeng som – sour/orange curry, quite similar to asam. It normally goes with seafood. 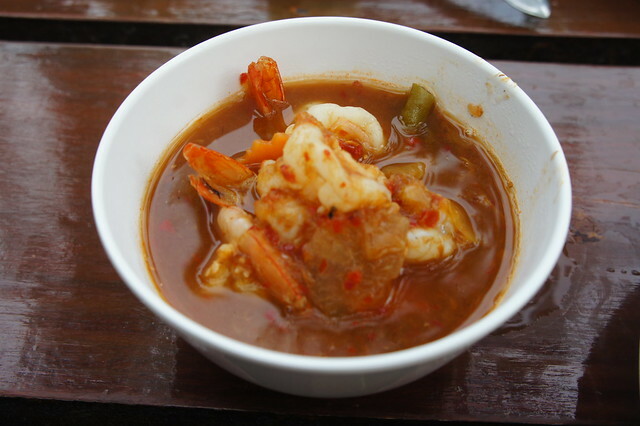 This is an example of gaeng som goong or prawns in orange/sour curry. Of all the gaeng I’ve tasted, gaeng som is often the spiciest. Galae Restaurant does it pretty – tasty and fiery. Don’t order this. The satay gai here has none of the “power” and aroma of our local satay. Bland and soft. 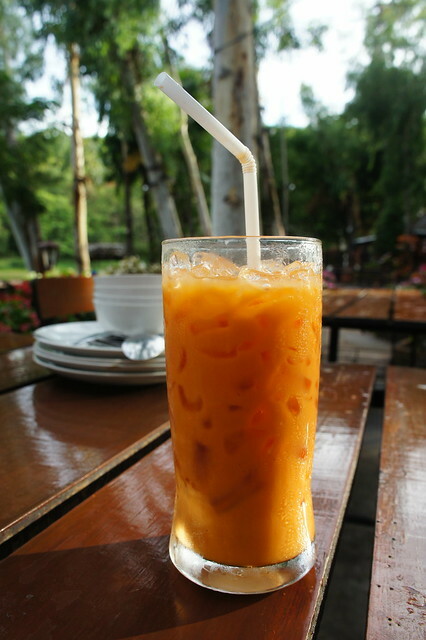 cha yen or iced milk tea. Pretty good. 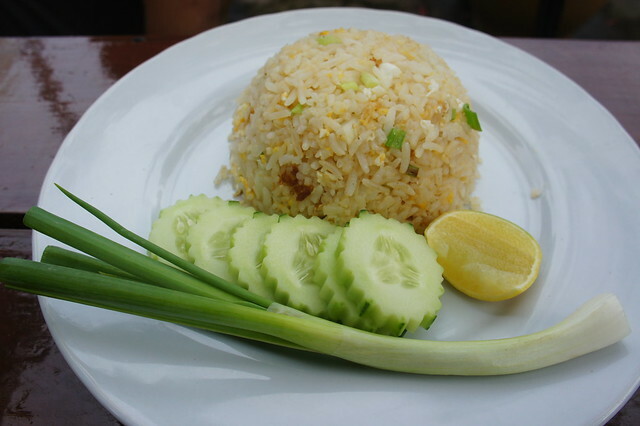 There are many different versions of kao phad. This is a lighter, more elegant version. If you prefer the more “powerful” version, you should go for the kao phad fried outdoors. 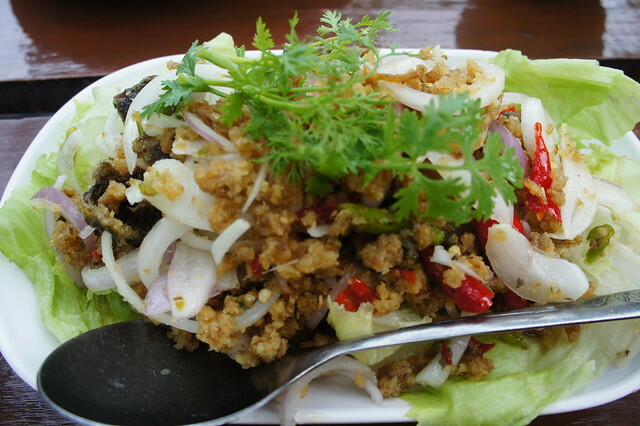 One of my favourite Thai dishes yam pla dook fu or catfish salad. I normally may catfish in a mango salad, but this one comes with onions slices. 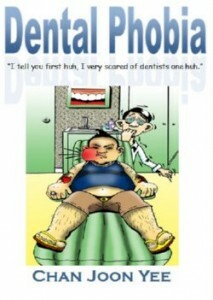 Not a real problem, but the dish seemed to have more onions than pla dook fu! Overall, the standard of the food here is still acceptable, but I enjoyed the old Galae more.